View of Derwent Water (sometimes known as Keswick Lake) in Cumbria, Northern England, from Brow Top. 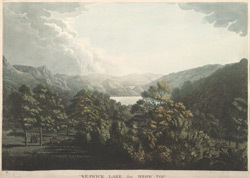 The Reverend John D. D. Robinson wrote a description of Derwentwater in his book ‘Views of the Lakes’, which was published in 1833, “The beautiful lake of Derwentwater is of oblong form, being rather more than three miles in length, and nearly a mile and a half in breadth. It contains, at low water, twelve hundred and ninety five acres, including the islands… By some this has been considered the finest lake in the north of England”.